“When You Look Like Your Passport Photo, It’s Time To Go Home” is a book, full of funny instances and valuable advice on travelling. Erma Bombeck narrates the funny incidents that take place during a vacation when their relatives stay at their place to reduce the total cost of their vacation. They lodge, dine, breakfast, and enjoying ultimate luxuries, all for free. She talks about how one of her relative leaves the children at her place and goes off shopping, and how the children bring the roof down. Erma also comments that when the relatives finally take leave, it was always a tearful parting. The relatives had tears as they had to shell out their money from then on, and Erma had tears of joy as the guests were finally prepared to vacate the house! This was my favourite part. Erma says, in the book, that in Spain, the bus is driven by an Asian. And, in Asia, the bus is driven by a German. And, in Germany the bus is driven by a French. In France, if a bus is driven by a French, then, Erma guarantees that it is certainly the wrong bus! This way, she teases and comments upon the funny aspect of different nationalities doing different jobs in different nations. And any idea when you have to stop travelling? Erma Bombeck provides you with an answer. Somebody tells you that you are in front of a great, famous museum, and you sit inside the car and ask the person to describe it to you. This is when you necessarily have to stop travelling(as per Erma). And finally, when Erma wants to fly back home, she comes to the airport to board her flight. 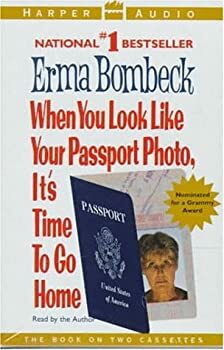 A man in the airport sees her passport and comments that she is looking exactly as she looks in the photo, and here comes the title of the book, “When You Look Like Your Passport Photo, It’s Time To Go Home”. I love this book. It is very humorous.